MAR 2018 NEWS – Are you entrepreneurial? 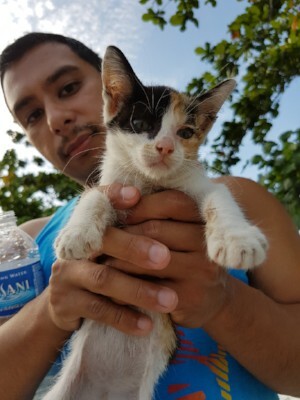 A Day at Cat Beach – Volunteer! Cat Beach seeks Managers to take projects to the next level. Ever dreamed of becoming a Barista or running a cafe? Could you manage a Charity Store? Or Booths selling t-shirts, buttons, other items? Love Art and want to organize Cat Art projects, shows, gallery? Education a priority? Come help start the CB Academy classes! Or help reach out to schools and other venues with educational programs! You choose your time and commitment. while helping cats! Please share your dreams by writing to catbeachsanctuary@gmall.com. A DAY AT CAT BEACH..
3 AM – Time to get up to feed a motherless kitten or a sick cat with dehydration. A Volunteer Foster Carer gets up to help. 8 AM – Breakfast Time! Hungry cats begin to circle, hoping for their morning meal. Night messes need hurried changes to prevent germ growth. A Volunteer cooks rice, opens cans and adds supplements for the cats’ breakfast while another washes dishes or cleans cages. 12 Noon – Meds Time! Cats with wounds or illness need their medications hidden in extra smelly food. A volunteer Cat Nurse measures medicines and distributes dishes of food, carefully following protocols from veterinarians. 1 PM – Out-and-About! A sick cat needs to be driven to a vet, shopping to be done, outreach and fundraising work going on around town or on computers, renovations and maintenance work ongoing. Volunteers hard at work on Administration, Buildings & Grounds, Cat Care, Fundraising & Outreach and more. 3 PM – Supplies Check! Are there enough wet food cans, dry food kibble, junior food pouches, and newspaper to get through meals tonight and tomorrow? On lucky days, the sounds of “Welcome to Cat Beach” echo as visitors drop in with gifts of food and funds or a delivery Truck drives up. If we have a Team volunteer on hand to do reception, visitors can even have a Tour or join other volunteers in Cat Care or projects. 4 PM – Dinner Time! Cats’ favorite time! 9 PM – Night Snack! Volunteers serve a 4th meal to kittens and sick ones; overnight food set out to ensure that all cats get fed, even those that missed dinner. 10 PM to Midnight (or later) – Is every floor and surface clean? Every cage locked and furnished with fresh water, food, poop tray, bedding? Volunteers head home or bed down for the night after checking the cats one more time. NO DAYS OFF FROM CATS’ CARE! Day after day, the work of our all-volunteer Team at Cat Beach Sanctuary continues. There are no days off from meeting the needs of some 250 cats. Volunteers are always needed. Won’t you join us, please? Dollars and Sense — To maintain consistent animal care, a committed staff is necessary. Currently we have 12 volunteers helping (the number varies, 5 to 15). To keep them able to help long-term, we try to give various compensations: a private room in a Batu Ferringhi apartment or at Cat Beach, reimbursements for expenses like telephone and internet connections, groceries and cleaning supplies, petrol and bus fares. As yet, Cat Beach does not have sufficient income to pay salaries. All new donations go first to feeding the cats – people do not eat until the cats are fed! If so designated by donors, other funds go to vet care or projects like renovations and repairs to the property. Currently, the costs for people to care for the cats — volunteer expenses — average RM 1500 per week, RM 6000 per month (about $1500 USD). It adds up but the help of people is crucial..Thanks to volunteers, every cat at Cat Beach gets fed, every sick or injured cat has its cage cleaned at least 2x per day, and every new cat or kitten that arrives receives flea and worming treatments– and all the cats get a lot of loving care! 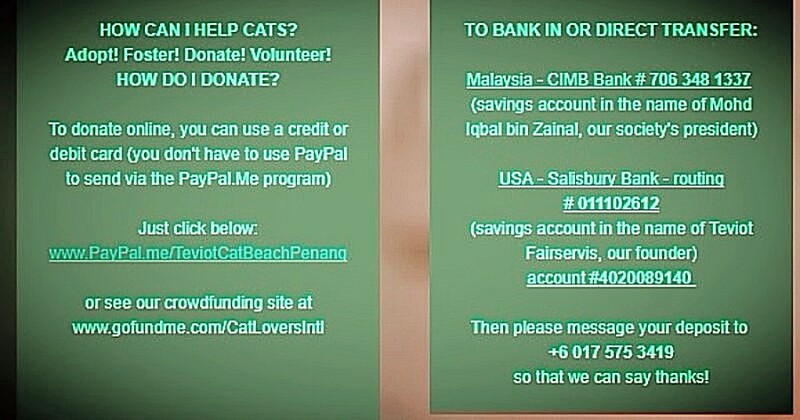 Please help Cat Beach support the Cat People by donating much needed funds or cat food. Consider volunteering! And share your encouraging words! Which book should I read next??? 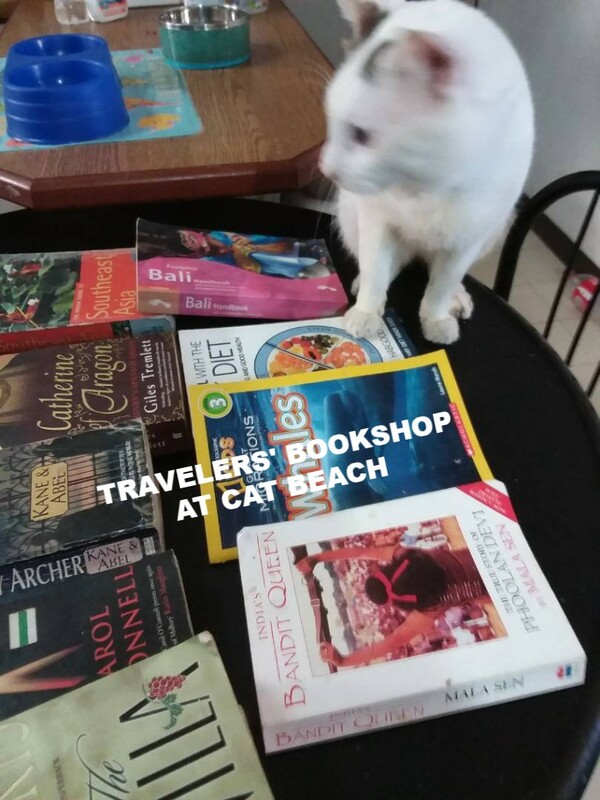 The new TRAVELERS’ BOOKSHOP AT CAT BEACH offers many choices! Open on weekends 11 am to 4 pm or by appointment. Stop by for a browse and a cuppa from the Cat Cafe! Paperback Fiction Mysteries, Thrillers, Detective Tales, Romance, and more! Biographies – History – Arts – Science – Kids’ Stuff and of course, TRAVEL! Launching the Cat Beach Adoption Campaign! Great Items from the 2nd Chances Charity Store – Jewelry, Toys, Clothes…Visit the TRAVELERS’ BOOKSHOP and enjoy a cuppa from the beachside CAT CAFE! ENJOY A DAY AT THE BEACH – WITH CATS! Produced thanks to help from student volunteers from USM. Find us on Facebook at Cat Beach Penang! to receive an invitation to our Whatsapp Chat – What’s Up at Cat Beach?